I cant write a lot just now. Our sweet darling gentle boy left us a short while ago to go across the rainbow bridge. I will write more when I can see through the tears. We will miss our boy more than we can say. I've heard Ginger Jasper's name many a time in the community. I'm so sorry for your loss. Purrs and hugs. - Alana & Crepes. We are so very sorry to hear- our thoughts. Oh no. We are SO very sorry to hear about Ginger Jasper's trip to The Bridge. Fly free, sweetheart, you're still in your family's hearts but we know you'll be sorely missed. Oh, no, Carol. I know you and Barrie loved Jasper and did everything possible to give him a good life. I'm typing through tears, so very sorry for your loss. Tears here too. We are so very sorry for the loss of GJ. Sending hugs and comforting purrs from all of us. Mom knows all too well, how hard a time this is for you. Oh we are so very, very sorry... We just read the news in an email from Ann. GJ will be missed so very much. We can only imagine how much your heart is hurting right now. We're sending purrs and prayers and hope that the love from your friends around the world gives you just a little bit of comfort. There's a beautiful orange angel out there...we know his love will be with you always. I am so, so sorry for your loss. I think GJ stayed with you as long as he could here on Earth, but just like your Mum, he will always be around you and in you -- in your heart and your mind, as well as in spirit. GJ is an icon of the Cat Blogosphere, and will forever be a star in our universe. We love you, GJ! Always. My heart is breaking for you and Barrie. I am in tears over this loss. He was one of the greatest sweetest mancats we knew. Know that we loved him and you and will keep you in our thoughts. Please take care. I'm so so sorry. We are incredibly sorry for your loss....words seem inadequate so we'll send hugs of understanding at what a tough time this is for you. I am sending purrs and purrayers, for your loss, and Daddy Kiril sends hugs and condolences. 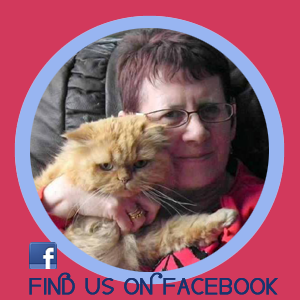 Mum, me, Pandora and Zowie send hugs, purrs, and purrayers for you, Carol & Barrie. We know Jasper will be missed quite a lot. 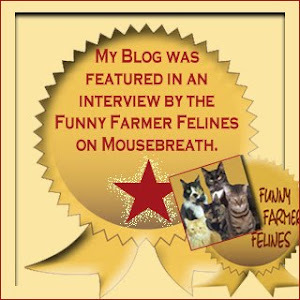 And he was one of our favourite kitties to visit on the blogosphere. I am so very sorry for your loss. I know that there are no words that can comfort your heart at this time, but I hope that the love you shared with GJ will ease the grip that sorrow has...in time. You did everything right and all that you could please be gentle with yourself. We will keep you and GJ in our prayers and know that GJ was beloved by so many around the world. We are all so very, very sorry for your loss. We're sending a million purrs your way. 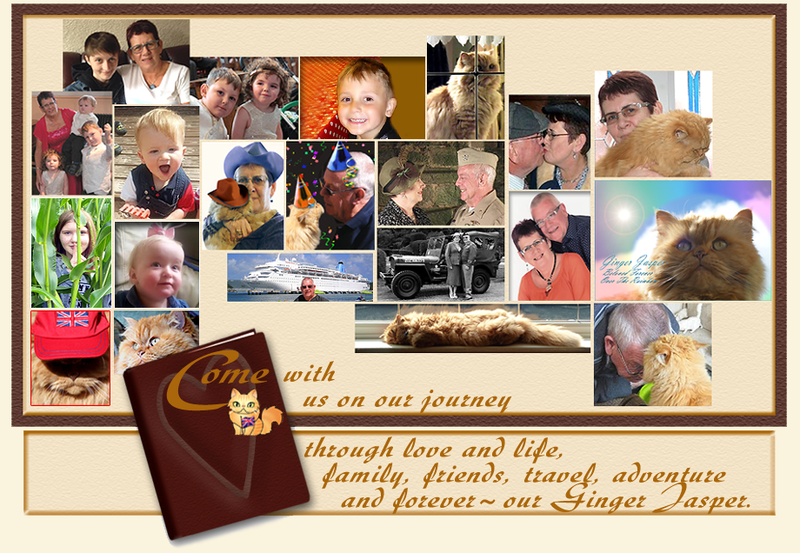 Ginger Jasper was such a wonderful cat and we feel honored to have known him, we'll miss him keenly. Please be good to yourselves--we love you! 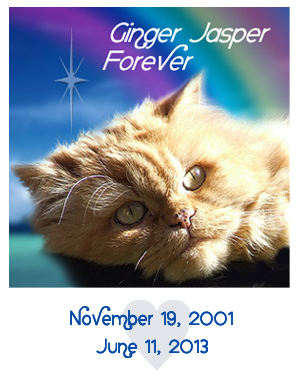 We just heard through Ann that you had to say good-bye to Ginger Jasper today. We know that he was loved and cherished by both of you. That you both did everything to make his life good and as long as it was meant to be.He will always be in your hearts; you need only look to find him. He is watching over you now and says," Thank you for loving me so completely." We just got to know about GJ earning his wings. We're so sorry for your loss, Carol and Barrie. We're thinking of you during this difficult time. 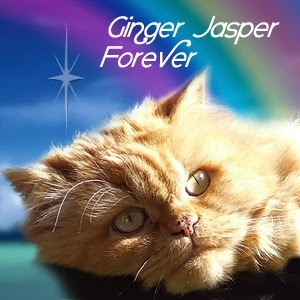 We haven't blogged for a long time, but we remember Ginger Jasper with loving affection. Tears are flowing for the loss of another friend. We pray that splendid memories replace your sadness as soon as possible. Oh dear God, not our GJ. We love you GJ and I cannot type through the tears either. I so hate you had to go my friend. We have only just heard this very sad news. We are sending our love to you both and know you will miss him so very much. We always looked for his handsome face every day as he was such a lovely mancat and it was such treat to see him in the yard and up on the wall. I had to wait in line but I'm here to pay my respects to Ginger Jasper. *bows head* He will always live on in your heart and soul. Please accept our condolences in the loss of Ginger Jasper. He was just a legend on this blog and we will all miss him greatly. Oh, Carol and Barrie, we are just heartbroken too. What a wonderful life!!! We know how much you will miss him, but no one could have given him anything more or better. He was so well-loved and he will forever be in all of our hearts. Soft woos and gentle hugs from all of us. Carol and Barrie, I am so sorry that GJ has gone to the Bridge. He fought a good fight and, with your help, had a very wonderful life. I feel like I really know him even though I've only met Flat GJ and the tears are flowing freely. (((Hugs))), purrs and prayers to both of you. Oh noes! We so hate when this happens, but we do know that now his appetite is back in full force and he is completely healthy. Our hearts ache for you and we are sending our bestest purrs to help soothe your broken hearts. We will miss your beloved GJ. Oh dearest GJ. I am in tears as I try to type. I am so sorry you had to leave, gentle dearest boy. Love and warm hugs to your family sweetest GJ. I am just devastated at this sad sad news. I prayed you would get better somehow, someway. I love you darling boy, and I will say goodbye for a space of time till we all meet again by and by. there are just no words - we are purrrrring lots for your GJ'sMomandDad. I don't have anything spectacularly comforting to add here, everyone else has been so eloquent. I'm just so sorry! We're so so sorry that Jasper had to leave to go to the bridge. Please know that you're in our thoughts, ours and prayers. We are so very sorry for your loss Carol and Barrie, GJ was a very special boy. We are sending prayers your way. I am so sorry to read that GJ has crossed the Rainbow Bridge. We will never forgot him and we know he will stay in many hearts all over the world. Our hearts are broken for you. What a great loss you have suffered. GJ was one of the most beautiful and amazing cats we've had the pleasure to meet in the CB. He was also our great friend. You are in our thoughts and purrayers. Our hearts are aching for your aching heart. I came over as soon as I hear that sweet Ginger Jasper has left. I am so sorry and my heart is breaking, mom is typing through tears. Though I haven't been visiting as much as I would like Ginger Jasper was a dear friend and I shall miss him. I will keep you in my thoughts and purrs. There will be a comet in the sky tonight. A red one. Oh no, no, no ... we are heartbroken that your beloved GJ has run to the Bridge. Your love and the amazing connection you have with him are so clear for all to see, and we, your friends, mourn deeply with you. We send love, purrs and prayers, and will now look forward to the blessed day we all see Ginger Jasper again. I don't have to say that it is very sad, it's more, I know exactly how you feel, I am with you with all my heart. Only time heals, he will stay forever in your heart. We are heartbroken for your loss. We know that he was loved until the end and we are sending you our love and prayers. We are so sorry to hear that GJ has left us. Thank you for sharing his life with all of us. He was a beautiful and much loved boy. I am so sorry to hear this news. I am sending purrs of comfort and peace to you during this time. GJ is one that will never be forgotten, as he has touched many. Oh Carol & Barrie! We are so sad that Ginger Jasper has crossed to the Rainbow Bridge! Our eys are filled with lots of tears!! 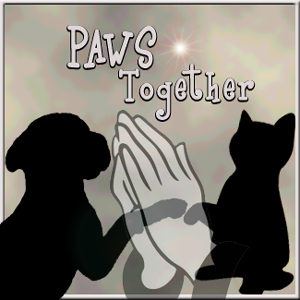 Our prayers and purrs are with you today!! Carol and Barrie, our hearts are breaking for you. GJ will always live in our hearts, his kindness will never be forgotten. We are so sorry to hear the sad news about Ginger Jasper, and send you comforting vibes and purrayers for your loss. Duncan, Dakota and Scooter all send their prayers and thoughts. He was a part of our morning every day! I am so very sorry. It is so difficult to lose them, even though they were sick for so long. Many hugs and purrs and purrayers and headbutts to you at this time. We haven't blogged for awhile but try to keep up with the news and are SO SO sorry to hear about Ginger Jasper. Such a sweet lovable boy. Hugs and purrrrrs to you during this difficult time. we are SO very sorry to hear about your loss. our heartfelt condolences. we send purrs and hugs over the net in this time of grief. GJ was loved by many including us. I am so very sorry for your loss. We are all crying buckets as GJ was a truly special boy who touched so many hearts. Sending purrs and hugs. There are not enough words to tell you how so very sorry Mom and I are to hear about GJ's passing. Our hearts go out to you. Oh my heart breaks for Carol and Barrie. I'm sitting here at work on my lunch hour and have tears streaming down my face. May all the love and support from your family and blogosphere friends and family lift you up during this time of great sadness. GJ, your new life is just starting. One without confusion and where you are hungry and get to eat all the prawns you want!! Please say a fond hello to my sweeties, Butterball, Greybeard, Sunkist, Moochie, Apu, Woody, Chloe, and Possum. I'm writing through my tears of sorrow to send you love and understanding. I had to have my darling Zebby Cat helped to the Rainbow Bridge back in August so I have some understanding of where you are both at just now. We send deep sympathy, Carol and Barrie. I was blessed to know GJ in a special way. My heart goes out to you at this very very sad time. Love, hugs, and purrs. Oh no, what a terrible thing for you, and all who knew Ginger Jasper. I looked forward every day for the past few years to seeing what he was up to on his blog. On such a day, even the blessing of having lived with him is dimmed by the pain of losing him. Godspeed, Ginger Jasper. Oh goodness, my tears fall as I type. I cant imagine how much loss you feel, I know we were not close friends other than blogging but I feel a loss with you. Soar high sweet Jasper and please if you see our TT Girl - give her our love. Comforting purrs and hugs to you from us and mum. He will live on in your hearts. We are so Sorry to hear that your Beautiful Ginger Jasper had to leave fur de Bridge. I'm so very sorry for your loss. Your sweet boy was beloved by so many and will be missed greatly. My heart is with you my dear friends. We are sending all our purrs and love and comfort right now. We are broken too over Ginger Jasper. Take care of yourselves. We know how hard your loss is. Our hearts are breaking for you and tears are flowing. Sending our love and all the support you can garner from your Colorado friends. Ginger Jasper's death is a huge loss to so many. We know, you, his family must be feeling indescribable grief. We are keeping you in our thoughts and prayers, and feel comforted in knowing that your beautiful boy knew the greatest love possible. We are so very very sorry ! We have always LOVED G.J. and we will miss him terribly. Run Free and Fast in Fields of Cat Nip Ginger Jasper. Dear Carol and Barrie....my heart breaks for you two and for our dear sweet Ginger Jasper. Ginger Jasper Eric and Flynn were among our first first kitty friends. We send you our prayers and hope they help you cope. I'm confident Eric was sitting at the OTRB waiting for His dear Friend GJ. So thankful I had the chance to know Ginger Jasper and had the blessing of drawing your beautiful furry son. we never had de honor ore privilege oh knowin ewe Ginger Jasper; but we noe ewe R leevin bee hind a multi tood oh friends who truly loved ewe. Purrs to the both of you today. And thank you for keeping us posted about GJ all these weeks and months, even though I know how difficult it has often been for you, both emotionally and timewise. 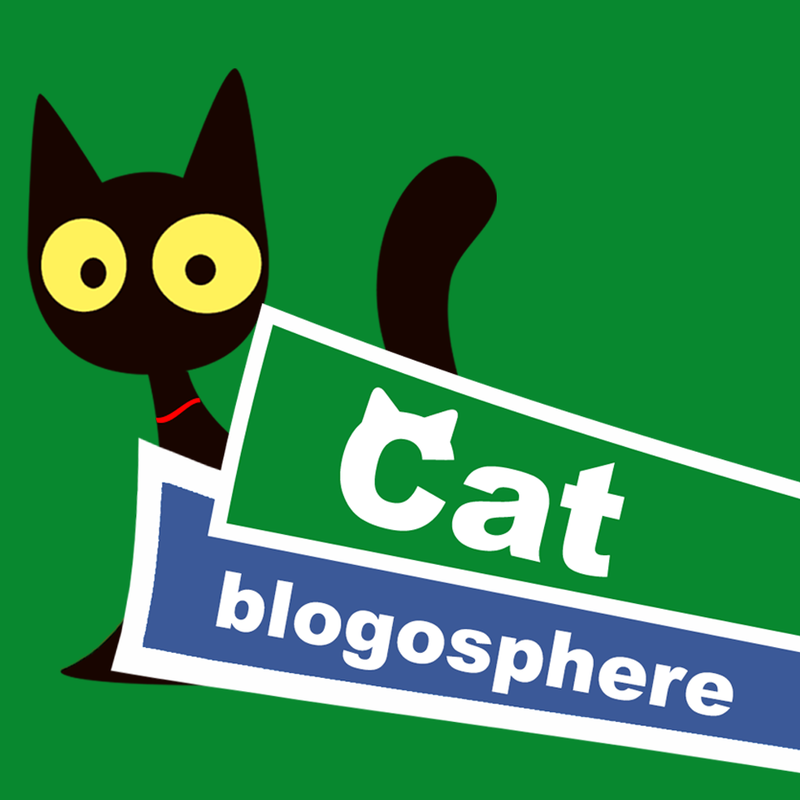 This is a very sad day for everyone in the cat blogosphere and we are all crying with you. We are so sorry to hear this news. We will purr,pray and light a candle in his memory. Oh no, I thought maybe something was wrong since we hadn't heard from you. Know that you did everything you could for him. I am so sorry to hear about Ginger Jasper, What can words say? Nothing! It is what is in the heart and my heart goes out to you today. I know I haven't kept up much on my blog since Casper passed, but I do keep up with the emails that are sent out by Ann's Zoolatry and it grieves me whenever a sweet fur baby passes. Purrs. huggs, love and prayers go out to you Carol and Barrie. He will live on in your heart. God Bless. I am so very very sorry you had to go Ginger Jasper.. We know you are no longer in pain and whole again at the Bridge, but the fact you are not here any more is hard to take. Purrs to you for Journey, and purrs of comfort and understanding to your mum and to all who loved you who miss you so. We could not share your heartache more totally if Ginger Jasper was a member of the White Dog Army. All we can offer are our tears to help wash away the pain, soft woos of understanding, and our loving paws wrapped around you in protection and solace. It gives us some comfort to know GJ was greeted by our Nuka and Quinn and that all are eternally in youthful health and waiting patiently for our arrival. Feel us with you dearest Carol and Barrie. Peace to Jasper and to both of you. I'm so very very sorry for your loss. He was an extremely handsome boy and this blog proves that he was one of the most loved cats on the planet. Hugs. Run free at The Bridge, big orange kittie. Sending gentle headbumps to Carol & Barrie. We are so sorry. Our tears join yours as we are so very sorry to hear about Jasper. We wish we could help with the hurt you both feel, but we can only offer comforting purrs and hope they help. We are so very sorry for your loss. GJ was truly a special mancat, and we know that you are hurting very deeply right now. But also know that you are loved. - Toby and Leia. GJ, I know you're up there with Huffle Mawson having a good time and neither of you are in pain any more. But we'll miss you terribly. My heart breaks along with yours and my tears flow freely. I am more sorry than mere words can say. We were privileged to have met your handsome ginger boy. Jasper will be forever loved and never forgotten. All our love to you both. My tears have been flowing since I heard the news. Many hugs and prayers for you and Barrie. We loved and will miss your gorgeous boy. Oh, no! I'm just able to log on now and Ann's message is the first I've seen. I am absolutely heartbroken for you. I don't even know what to write--in truth, there aren't words to help you right now. Just know that the love and Light of purrs of many around the world are with you now. Wishing GJ godspeed and sending prayers and hugs. Our hearts are breaking for you. Losing our beloved furbaby is like losing a child. He fought long and hard and now he is at peace. Big HUGS to you - his family. He was a special boy and loved by so many in the blog world. Fly high sweet boy - we'll watch for your star in the sky tonight. (((hugs))) from O Hi O.
Oh we are very sad to read this. We send our heartthrobbing condolences to you all. Oh my Dear Lord we are so heart-broken to hear this! He was the epitome of a true companion. We can't tell you how truly sorrow we are for your loss. He held on for you to adjust and he knew it was now time. May you have peace and contentment knowing he is not in pain and finally free of illness and can run with his friends. God Bless you both Dear Friends! Oh we are so, so sorry Carol and Barrie, this is so heart-breaking. We love your GJ and we know how deeply you love your precious Jasper. It is evident how you have always provided the best care for him and always done the very best for him. Wrapping you all in thoughts of love and light and holding you in our hearts and prayers. Carol, sending love to you and your family. We're so sorry for your loss. Sending PURRS from all of us at Purrchance To Dream. Rest in peace, dear friend. We will miss you so very much. I always liked that there was another orange cat out there named Jasper. We'll be purring for your family. Our hearts are breaking for you. We are so very, very sorry for your loss. My heart is breaking for you. Your kitty really touched my heart. I am so sorry for your loss. RIP sweet Ginger Jasper. Sending many purrs and hugs. There are no words to comfort you at this time as you grieve over your precious GJ. He was well loved all over the world and will always hold a special place in Mom Paula's heart because of his connection to Sweet Praline. Please know our very best thoughts and purrs are with Barrie and you right now. Even though it's a very sad time right now, we smile when we think of the reunion Sweet Praline and GJ had today and that both of them are watching over us. We will be shedding tears with you for a long time. GJ will be missed. We are so sad to hear GJ has gone to The Rainbow Bridge. Such a beloved fuzzy man cat...all our hearts are broken. Carol, Barrie and dear Angel Ginger Jasper. I write this through tears. We did not know you long but loved to see you and that wonderful look you would give. We know you have been welcomed over the Rainbow Bridge by our Angels and many more who you have touched with your gentle soul. Love from all of us at the Tomcat Home. Dad Pete, Timmy, Toby, Buddy, Rumpy, Fitz, Buttons and little Einstein. We're so sorry to hear this. How terribly sad. Our condolences to you. We hope it's some comfort that Jasper had a lovely life with you. He couldn't have had a better family. We just met GJ a short time ago, but he touched our hearts from the first. We are so sorry he had to go to the Rainbow Bridge -- he was so very loved and he will be so deeply missed. Such a joy to have shared your lives with this gorgeous, gentle, fuzzy boy. The love you shared will endure forever and ever. Love and hugs and purrs from Thomma Lyn and the Ballicai. Our sincere condolences to you. At least he will always live in your heart. We are so sorry for your loss. Purrss to you all. Carol & Barrie, I am so very sorry for your loss,I know how much you loved sweet GJ. I hope your memories will give you peace f mind, eventually. My deepest condolences, we are purring and praying for you. We won't ever forget JG and he will live in our hearts as well as yours forever. Oh Carol and Barrie... if only I had the words... I am so, so sorry to hear that Ginger Jasper has crossed to the bridge. My heart is with you and I send purrs of love and comfort to you. Run free sweet GJ! Your posts had the ability to brighten the darkest day. We will miss you. I'm so sorry. Hug and love to you. We are so very sorry for your loss. We just heard that Ginger Jasper is at the bridge now. Mu brother Weenie loved cats and I bet the are chasing each other around right now. Out thought & prayers are with you. we are heartbroken for you. My eyes is full of tears... I don´t know to say! Your heartbreak is our heartbreak too! RIP Sweet and Fluffy GJ!! We are so sorry for your loss. I know there are no words that can truly ease your sadness. I send my hugs and the boys send purrs to try to ease your hearts my friend. He was such a very sweet boy. So sorry to hear this news, we know how precious Ginger Jasper was in your life, and how heartbroken you will be. We are so very sorry. We will miss Jasper, too. We hope that knowing how much he was loved by all of us...and will be so dearly missed...helps bring you some comfort. We send you gentle purrs, headbutts and hugs. I am so sorry to hear of the crossing of GJ. We've got a candle lit - run free, Ginger Jasper! We are so sorry for your loss. Words can't really express it. He was a wonderful boy. we will miss him. Toffee and I are so sorry for your loss of sweet GJ. Again, may God bless you now. We are so very,very sorry about Jasper. We know he is well and happy with all the others over the bridge and one day we will see all of our little ones again. We send you our purrs of love and comfort. Please know we'll be purring - and woofing - around the world to help GJ's journey be a safe one with spiders along for guidance! Thanks for sharing Ginger Jasper with us. We will always remember him. Dear Carol and Barrie, we are so sad for you and for gorgeous GJ. We know he's not been well for some time but hoped, anyway, he would be with us forever. Beautiful, generous, ginger love. We send all our love and purrs to you knowing how hard this must be. GJ will be with us always. We just heard the terrible news. We are so very sorry for your loss. We have been praying and purring for GJ. RIP sweet boy. Hugs and love to all God Bless. I am so deeply sorry. Ginger Jasper was a handsome mancat. My thoughts and prayers are with you all during this very sad time. We are very sorry for your loss. We will love him always. Fly high GJ. You were so lucky to have Ginger Jasper and he was very lucky to have you. I hope it is of some consolation to know that he touched thousands of lives. No farewell words were spoken, no time to say goodbye. You were gone before I knew it, and only god knows why. My heart still aches in sadness, and secret tears still flow. What it means to lose you no one will ever know. But now I know you want me, to grieve for you no more; to remember all the happy times, life still has much in store. Since you'll never be forgotten, I pledge to you today: a hollowed place within my heart is where you'll ALWAYS stay. I'm so sorry. My deepest sympathy to all who loved Ginger Jasper. We are so sorry to learn that Ginger Jasper ran off to the Bridge. Even though your hearts ache with his leaving, know that he was welcomed by many. William, Caroline, Russell and mom. I am so sorry to hear of the passing of your darling kitty. Our house sends so many purrs, and much love to GJ's Mum and Dad. What a sweet, sweet feline. Such a support to us, when we shed tears in our own house. Our hearts go out to GJ and his family--such a gallant fight,and we already miss him. Heaven just received the purr-fect angelcat...Psalms 50:15. Oh, GJ, so sorry to hear that you had to leave. We will miss you here but there will be a lot of furriends waiting to play with you over at the Bridge. Run free, sweetie, until we meet again. Purrs and hugs to you family. I have been following your posts for years and am so sad that jaspers time has come to an end. Wish you both the best. We are so so sorry for your loss. Our hearts are heavy to hear this news. GJ was one of the first to comment on our blog. We always check his every morning. It was a warm fuzzy ray of golden sunshine to start the day. We will miss him over here across the big pee. All our love, Bonnie and Kenzie, the wee Scottie girls, Pam and the Mr. So sorry for the loss of sweet Ginger Jasper. We pray for the comfort of your soul! We are so sorry - GJ was a really special cat, a legend in the feline world, and we will really miss him even though we never met him in purr-son. Thinking of you both and you sending our love from NZ. Riley, Enzo and "F" (who is our human who has wet eyes too). We love and miss you so much, GJ. Fly free, our sweet friend, and wait for us at the Bridge, okay? We are devastated at this news & we know it's a million times worse for you. We can't begin to tell you how much we love GJ & you. 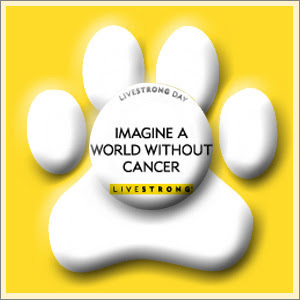 Please know that you are in our hearts & purrayers. RIP GJ...you will be missed & loved forever. imagine a world without Jasper in it. All of our love, ALWAYS. We are so verry sorry that Ginger Jasper has crossed the Rainbow Bridge, and we send gentle purrs and headbumps to Mum Carol and Dad Barrie. We will miss your boy very much. We are so sorry to read that GJ crossed the bridge. We are so very sorry to hear this sad news. We were hoping things would turn around for him. We love you, GJ, and we hope that you will find peace over at the Rainbow Bridge with so many friends. Ginger Jasper was a highlight in our day - his blog is a must-go-to every day and we loved him so much. You and he were very lucky to have found each other. The Clarks in Carolina. The moment each and every one of us who love our furry little famil members dreads has come for you and I have no words that will ease this time of grief. Thank you for sharing this beautiful boy with the cb. While I no longer cat blog I have been peeking in from time to time. GJ will be missed by ao many. hugs and purrs from me and the Gs. I am so very sorry for your loss ...Ginger Jasper was a legend and so special in the blogging world. I know he will be missed so much by so many. I know he is happy and free and young again at the bridge. I hope he and Pip have found each other and are together eating cheeseburgers and running free through fields of flowers. I am so sorry. So many tears for your boy. It is a tribute to the way that you love him that so many around the world absorbed that love through your words. You will be together again, until then he is safe in your mum's mum's arms. My prayers are with you and your husband in your grief. Run free with the mousies, Ginger Jasper! Our thoughts are with you mom and dad. We are so very sorry to hear the news this morning about GJ. Our heart goes out to you. May he be running free with our furends at The Bridge. We are so, so sorry to loose one of our dear friends. We will remember him always. We know that he lives on in the hearts of so many. Lamento a sua perda. É muito triste. I am typing through the tears too!!! Ginger Jasper say Hi to Happy cat and Bambi and Zoie for me!!!!! 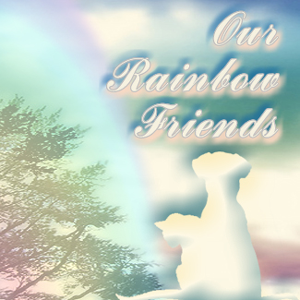 WE miss you all over there at the Rainbow bridge!!!!!!!!!!!!!!!!!!!!!!!!!! Will always love you all so much!! Oh No! I'm so crying and my heart is aching so much for you right now! I kept hoping that Ginger Jasper would pull through this time too. We will always have a part of your silly sweet Ginger Jasper in our hearts forever! So so sorry to read about Gunger Jasper crossing over the rainbow bridge. He sure fought well. We can only offer hugs and prayers from all of us and we know how difficult it is for you right. GJ, thanks for sharing your adventures with us through this blog. We are so very sorry for your loss. Run free, GJ! I do understand. Write only when and if you can. Those damn cactus blossoms seem to predict death. We are very sorry for your loss. We send you comporting purrs. I am so sorry that Ginger Jasper had to leave for the Rainbow Bridge. He is running and playing in the sun now like a kitten. I am sure that there are spiders there for him to chase. I send hugs and the kitties send comforting purrs. We are sending warm and peaceful thoughts to you. My thoughts and prayers are with you as you go through these days. You gave GJ a wonderful life... Thank you. My heart sincerely cries at the physical loss of your beloved, Ginger Jasper. There are truly no words that I can share that would ever diminish the pain of this loss, as our cats ARE the LOVES of our LIVES. I do believe though, that we WILL reunite with our fur-babies when our souls also move on. May you take comfort in the memories shared with this most loving boy. You gave to him more than his dear self could ever have imagined receiving when simply a small mite of a kitten.